The Niagara Of The South? What? The Niagara of The South? Never heard of it? Me either, not until Jeff told me about it. Instead of seeing just rainbows in the water, you can also see moonbows. Yes, you heard it right, MOONBOWS. Where is the phenomenon? Just over the state line from Tennessee into Corbin, Kentucky there is this really neat place called Cumberland Falls State Park. 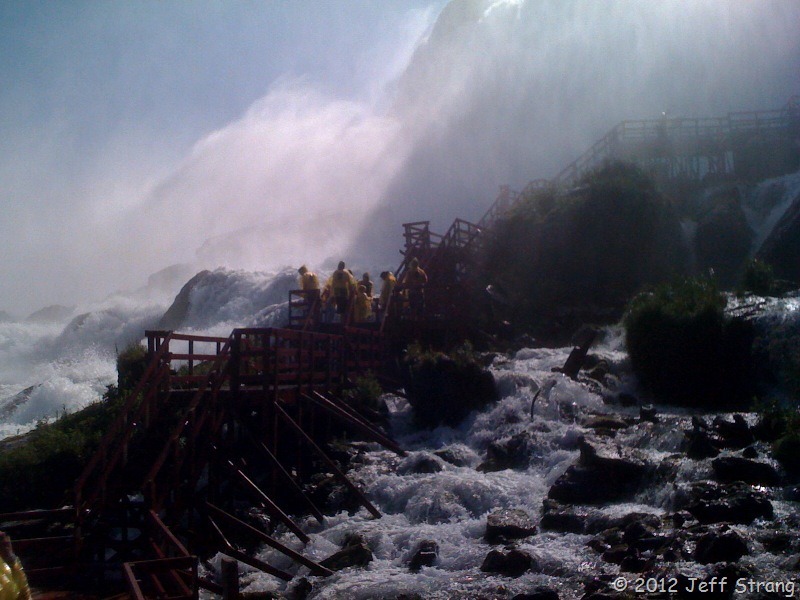 There’s hiking trails, cabins and camping as well as a beautiful viewing area of the falls. The fact is, on a full moon night, there really is a moonbow in the falls! I know because I saw it! Photographing it has been a challenge, so for now, enjoy Cumberland Falls State Park from a sunny view! Whether looking at the Falls from the top or looking up at them from one of many viewpoints on the trail alongside the river, it is a beautiful sight as well as a beautiful sound! Waterfalls have always held a certain fascination for me that I just can’t explain. There’s something about the crashing water and the mist, the rainbows that pop out from just the right angle that are just so calming to me. And now…on a full moon, beautiful prisms of color will appear! I can tell you that the first moonbow that appeared left me speechless. I had never seen anything so spectacular in my life! There are no adjectives that would adequately describe just how beautiful a moonbow is. You’ll want to get there early enough to get a great viewpoint because it gets crowded quickly. We tried to do timed exposures, but there were too many novice flash bulbs going off every second, so none of our timed exposures turned out. I suggest finding a quiet spot, possible further down the trail away from the crowds or maybe confirm with the park ranger when their slowest and least crowded nights are the best for serious photographers. I was actually surprised at how many people showed up the night we were there. 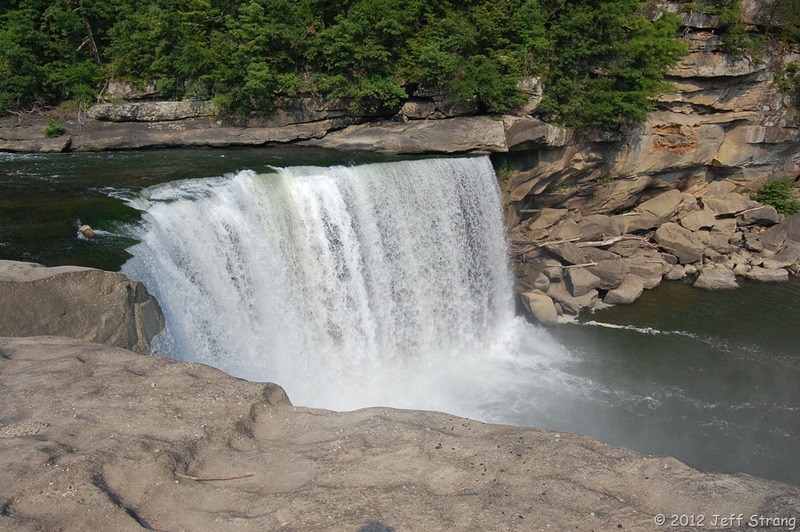 Known as the “Niagara of the South,” the Cumberland Falls is a mere 125-foot curtain across the fast flowing Cumberland River. 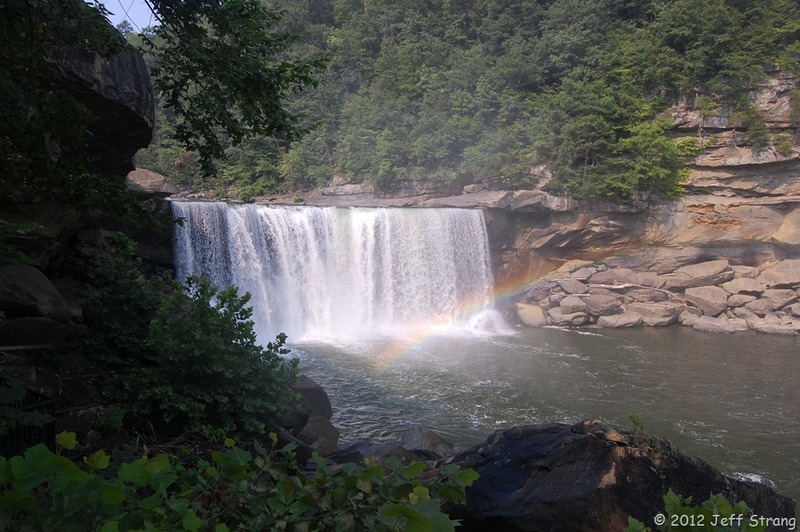 Compared to THE FALLS – this beautiful gem of the South is no comparison! 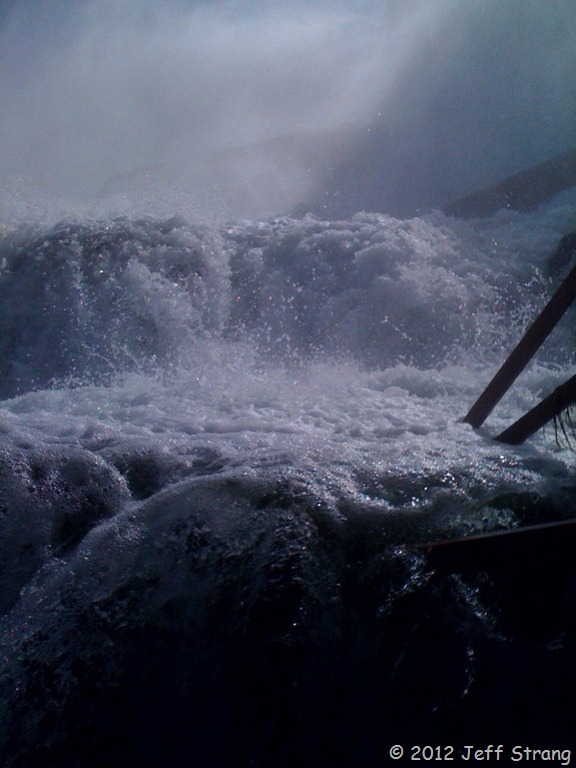 It may be the “Niagara of the South,” but it’s no Niagara! 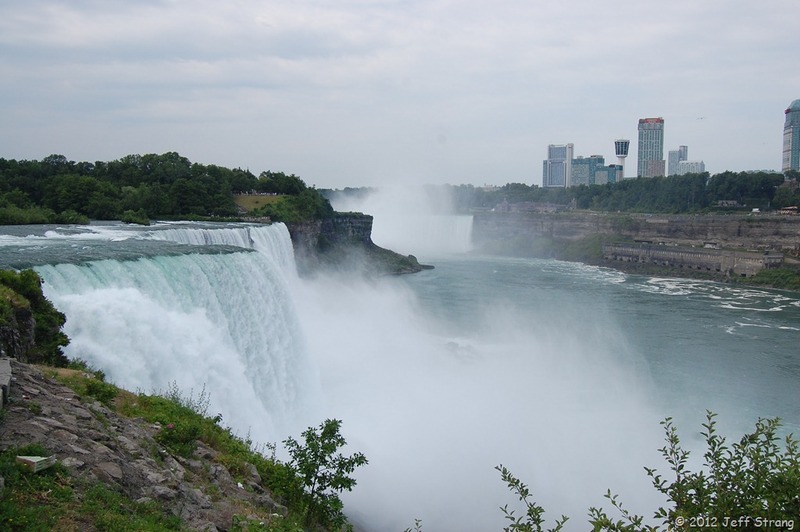 As young children, our parents made the trek to Niagara Falls, New York. Both of our families visited the famous honeymoon spot at a similar point in our childhood. I was just barely 6 years old, and oddly enough, Jeff was about 5-6 years of age when he went! Our families had not yet even met! 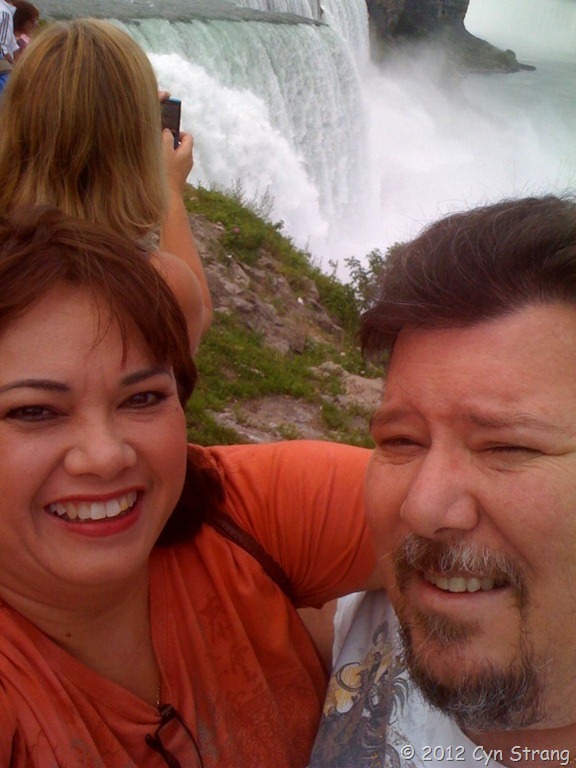 Now, many years later as a married couple, we decided to take a “second honeymoon” to Niagara! We love road trips and this was just up our alley! Literally! There’s just one thing I’d like to ask you to keep in mind if you decide to pack your bags and head for Niagara. Think about what time of year it is that you plan to arrive and spend your vacation! We decided that the July 4th weekend would make a perfect long weekend trip. We could drive up in a short amount of time, spend a few days there and drive back and not have used more than just a couple of Jeff’s vacation days due to the holiday! Yes, that was a wonderful idea! It was warm – so getting wet would not be a bad idea. We didn’t have to worry about packing parkas, gloves, boots, that de-icing stuff, ice scrapers and any other various winter items one would need…..
…but wait! It was going to be a HOLIDAY weekend on both sides of the river! Why didn’t any bells go off in our heads????? 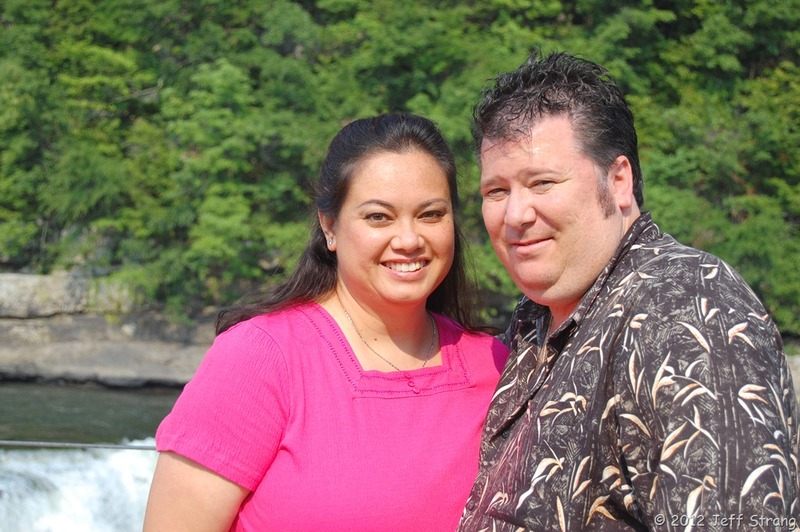 HOLIDAYS on both sides of the river, newlywed Royal Couple…. …..shouldn’t that mean……….MILLIONS of people??????? There were no bells, there were no whistles, there wasn’t even a beep! Imagine that! 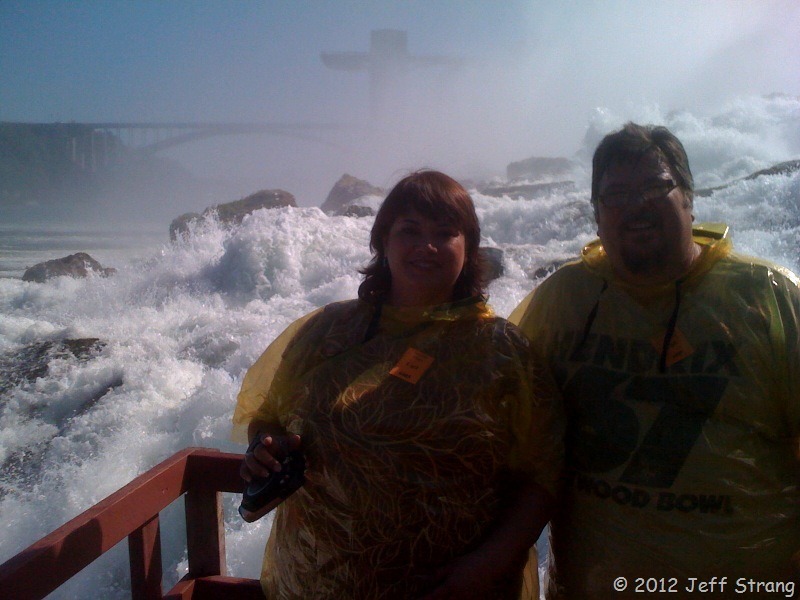 We stopped at a little place that first night in Niagara and arranged for a tour to the Falls the next day. Once we realized our HUGE lapse in memory, parking at the Falls was out of the question! It was almost as much as a tank of gas…..because there’s no parking in just one spot and walking around all day! There’s a lot to park in at each of the different areas! The tour group had a large, off-site parking lot, air-conditioned buses, and a driver that knew how to get around quickly! Our tour guide turned out to be a loveable, grandpa-kind-of-guy named Carl who remembered us as Mr. & Mrs. Tennessee! Carl was adamant about being prompt and also knew how to make everyone laugh. We really enjoyed his presentation at each stop and enjoyed the views even more! Since the July day was so warm, our tour of the Caves In The Winds was a refreshing stop! I’ve been through a few storms, like hurricanes, but walking up to the Hurricane Deck is an experience I will never forget! Let me just say that trying to stay dry is, at most, impossible! The DVD-cam was tucked up safe under my poncho for most of the walk. I only brought it out to capture a few moments of squealing and laughing, while the rest of the time we used Jeff’s trusty iPhone camera to capture some of the following shots! Enjoy! Did you notice the LARGE crowds? Does this LOOK refreshing? It IS! And the sound is deafening!!! 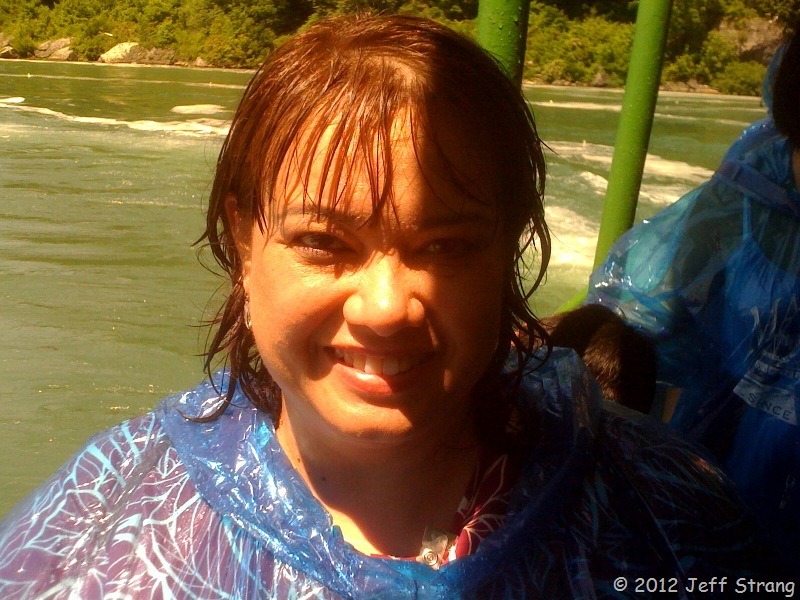 But the most fun was getting soaked on the Maid of the Mist! 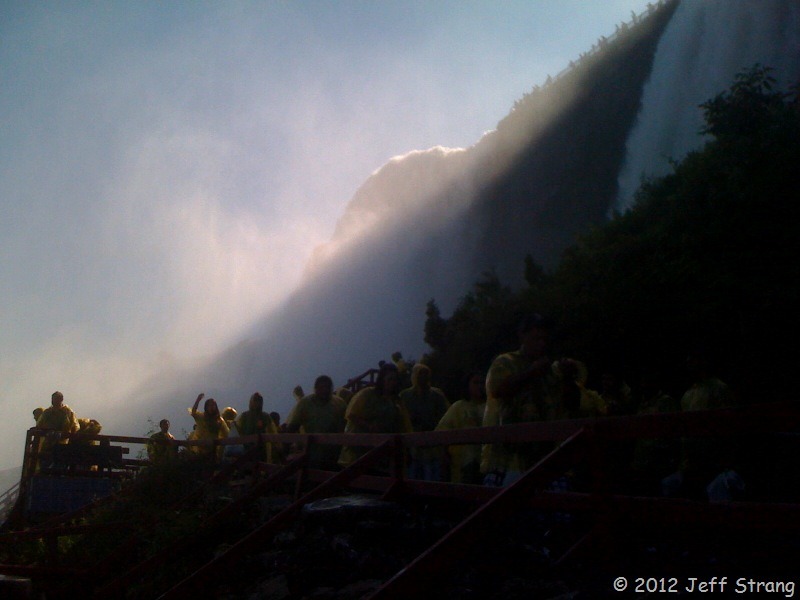 This is where we get to see the Canadian side of the Falls. What a sight this is! 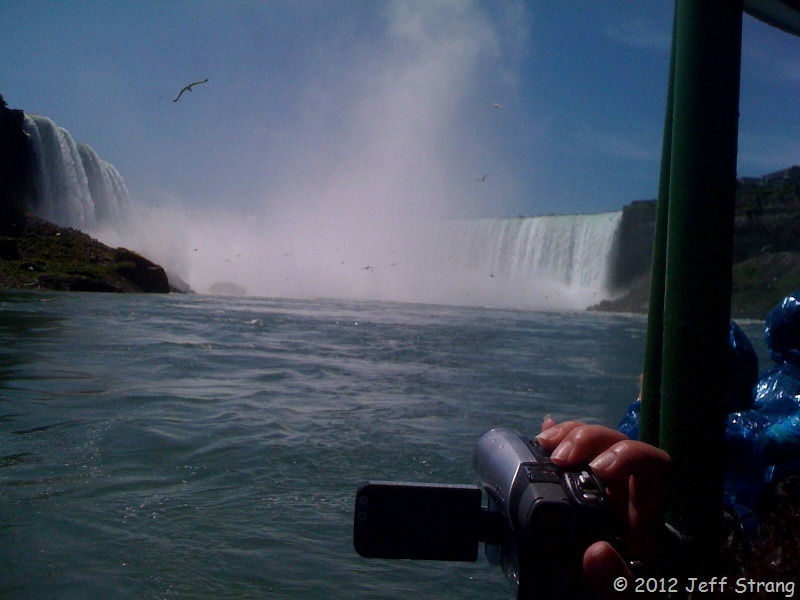 What a wonderful memories we have of “both” Niagara Falls! I highly recommend them both! We’re planning on going back during a different season one day…. Thanks for the trip. I feel refreshed already! 🙂 There’s nothing like a refreshing SOAK from an absolutely COLD waterfall!